A Shelley, French pattern mould. 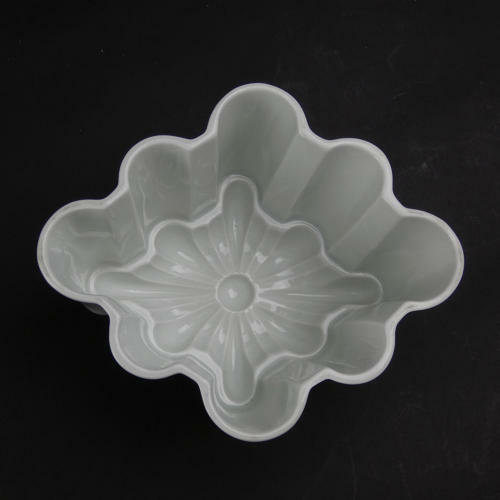 This mould was produced in the 1920’s, when commercially produced jellies were becoming popular. The design, which has narrow fluting to the top and wider fluting to the sides, was named by Shelley as the French. It was made in four different sizes and this is size number two. It is impressed with a ‘2’ in the base. It is also marked in green print to the side of the mould with ’Shelley’ within a shield and ‘ENGLAND” beneath. It is in excellent condition. Shelley moulds do turn out well as the designs are always crisply moulded.